IMPORTANT: National Geographic Sea Lion cruises must be reserved over the phone. Call us for more information. National Geographic Sea Lion is a tried and trued expedition ship that gives guests exclusive access to all corners of the American Pacific coast. Carrying only 62 guests creates a sense of family for all of those aboard. 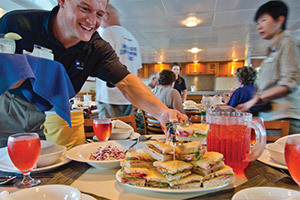 All guests and crew feel like an integral part to the experience on every voyage. All staterooms onboard National Geographic Sea Lion feature windows so guests will never miss an opportunity to view the passing scenery. The highlight of any cruise on National Geographic Sea Lion is the destinations themselves. At every stop along the route guests will be able to take part in exciting activities. These may include kayaking, snorkeling, bike riding, or even mountain climbing. 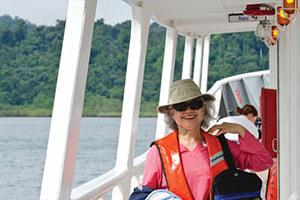 To help you with these excursions, National Geographic Sea Lion has experts onboard. These experts will ensure that every guest will get the maximum amount of enjoyment out of every second of their National Geographic Sea Lion cruise. Conservation is one of the founding principles of National Geographic magazine and National Geographic Sea Lion embodies this. 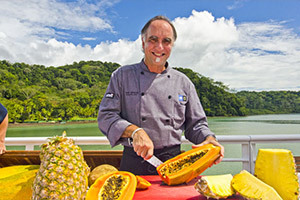 All food featured on every cruise is gathered from local and sustainable sources. This reduces the environmental impact of every voyage. Chefs onboard do amazing things with these ingredients and provide for some wonderful culinary excitement. 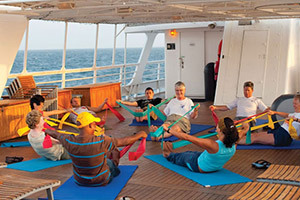 All excursions and explorations on National Geographic Sea Lion are included in the cruise price. That means guests get to spend more time experiencing and less time worrying. From wildlife viewings to visits with local peoples, all will be provided for you. 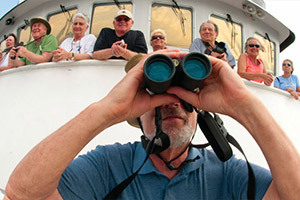 Huge Discounts & Low Price Guarantee on all National Geographic Sea Lion Cruises! Book any National Geographic Sea Lion cruise with us and you'll get the best deal possible, regardless of the ship or sail date! 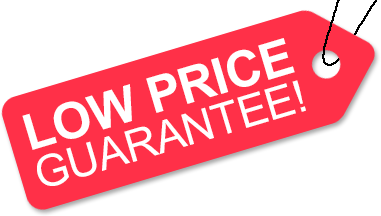 Because of our huge price discounts and "Low Price Guarantee," nobody beats our National Geographic Sea Lion cruise prices, so look around and you're sure to find the best National Geographic Sea Lion cruise deal possible when booking with us! We do not charge booking fees on any cruises! 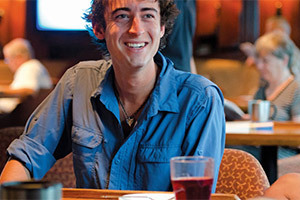 You're sure to enjoy an affordable National Geographic Sea Lion cruise when booking with us! Our special offers on National Geographic Sea Lion cruises may not be combinable. Certain restrictions apply to each offer. View terms and conditions during the online booking process. Standard Staterooms are outside facing with one or two windows. Categories 2 and 3 open to the outside deck. The deck plans of National Geographic Sea Lion provided on this page are subject to change. We reserve the right to correct errors. Please verify all information with Lindbland Expeditions directly.